A sweet and sour candy appletini. Place 1 bag of sour worms in a large air tight container. Pour vodka over sour worms and let sit for at least 24 hours. 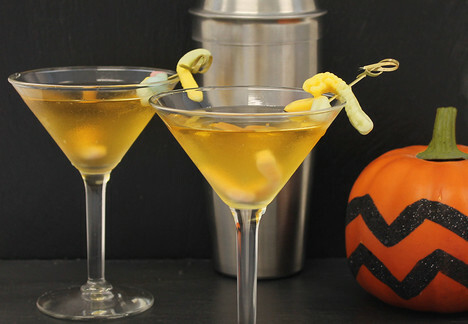 Combine one ounce of sour worm vodka, ice cubes, apple juice and lemon juice in a cocktail shaker. Shake vigorously then pour into martini glasses. Pour two ounces sparkling water over apple juice mixture. Garnish with desired amount of sour worms. Serve immediately. Tip: You can store the leftover sour worm vodka in your refrigerator for up to six months.